Delicious and sweet, pears are a very good choice to keep healthy and fit. Whether they are wild or cultivated, pears are nutritious and have surprising health benefits that will make you reconsider their status and nutritional value. Moreover, they make incredibly refined desserts, as Pliny the Elder, for instance, recounts in his book of natural history. Whether you prefer them raw, stewed, made into a delicious jam or baked into a fancy dessert, pears are definitely a good choice for any healthy, varied and balanced diet. From a nutritional point of view, pears (Pyrus communis) arise as a modest source of vitamins and minerals, providing small amounts of B vitamins, vitamin C, potassium, copper, magnesium, manganese, iron and phosphorus. What makes pears good for health is first of all the fact that they are easy on the stomach, have a high water content, no sodium, negligible amounts of fat, but rich carbohydrate content. Adding to the benefits is their good fiber content and surprising, but beneficial health effects. The fruit of the pear tree is a varied source of nutritious substances that can help our kidneys with diuresis, encouraging them to better detoxify the body of toxins. This is helpful both for the good functioning of the kidneys and good for high blood pressure sufferers because diuresis helps eliminate excess sodium from the bloodstream. In addition to anti-hypertensive benefits, the effects of pears on kidney function also reduce water retention and puffiness as a result of it. In addition to this, pears prevent and help reduce prostate inflammation and cystitis, the inflammation of the bladder. However, eating pears does not constitute treatment for bacterial infections which are often the cause for bladder inflammation, or any type of infection really. What this means is that while it may help to eat pears to keep healthy, when you have a bladder infection it is more important to take your antibiotics as your doctor recommended you to. Some studies suggest that pear seeds contain the so-called vitamin B17, thought to be a potent anticancer food. However, vitamin B17 is actually a poisonous substance at origin and ingestion of too many fruit seeds, pits or kernels containing it is life-threatening. The name itself is misleading because the substance is not really a vitamin, but a toxin. Other sources of vitamin B17 include apple seeds, plum pits, apricot kernels and peach kernels. Pears have a refreshing and mildly sweet taste, making them great for whenever we might be feeling under the weather, especially when we might be experiencing nausea or vomiting or have little to no appetite. The refreshing, sweet and fragrant taste and smell of pears can stimulate appetite. The fact that they contain small amounts of almost the essential vitamins and minerals can contribute to our recovery. Pears contain the following nutrients: A, C, E, K, B1, B2, B3, B5, B6 and B9, potassium, calcium, copper, iron, magnesium, manganese, phosphorus and zinc. Pears also have mildly astringent properties which may prove useful if one has to deal with acute diarrhea. As funny as it may sound, diarrhea is a serious condition that may lead to acute dehydration and multiple mineral and vitamin deficiencies. While eating pears alone will not treat diarrhea (if it’s infectious diarrhea, you need antibiotics), their high water content combats dehydration efficiently and restores well being. The small amounts of vitamins B1, B2, B3, B5, B6 and B9 in the fruit, which are crucial for the process of cellular construction and energy metabolism have benefits such as improved energy levels and better digestion. Of course, you would have to eat several pears to get even as little as 10% of your daily recommended intake of B vitamins, but it’s not like you can limit yourself to one pear once you taste how sweet it is. 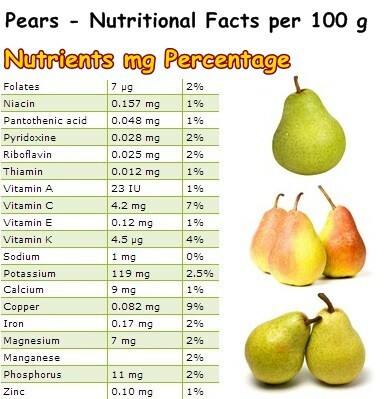 Pears contain small amounts of calcium, phosphorus, magnesium and potassium. Calcium, phosphorus and magnesium are essential for strong bones and teeth, contributing to better bone density, although you need far more of the three nutrients than pears can provide. Milk and dairy, spinach are richest in calcium, fish and seafood in phosphorus while seeds in magnesium. Lastly, potassium is our heart’s best friend: it reduces high blood pressure by counteracting sodium effects and helps regulate heart beats with benefits for palpitations, extrasystoles and other benign arrhythmia forms. If you look at the nutritional table above, you will notice pears provide 7% of the RDA of vitamin C. As you may already know, vitamin C is not only the best natural antioxidant, but also plays a crucial role in the synthesis of collagen, the miracle substance that keeps us looking young and beautiful. Additionally, vitamin C strengthens the immune system and with a 4 mg concentration of vitamin C, pears are a modest, yet somewhat reliable source of the nutrient, especially if you eat more than one. The skin has the highest concentration of vitamin C, as well as dietary fiber for regulating intestinal transit. Pears are quite rich in fiber, containing 3.1 g of fiber per 100 g, most of it being located in the skin of the fruit. This is a great amount and the source of many of the health benefits of the fruit. For example, the fiber in pears regulates digestion and transit time, helping relieve constipation. Moreover, it boasts prebiotic benefits, while the fruit itself is easy on the stomach. What is interesting is that pears are also one of the least allergenic fruits, thus are highly recommended for anyone who is having a hard time keeping their allergies under control. However, if you have multiple food allergies, always check with a doctor first before trying new foods. 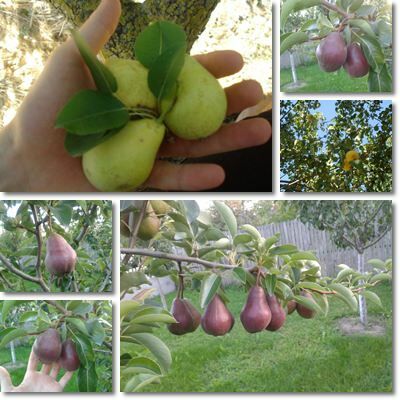 Usually, pears are very fruitful and can easily withstand cold weather so it is worth planting your own pear tree. Especially when you can never be 100% certain that the fruits you buy are organic. Remember that what really matters is growing natural food, without any pesticides or other dangerous substances. Pears may not look perfect or be a concentrated source of nutrients, but you will definitely get some great health benefits from them. And the taste of real fruit is unparalleled. Natural or organic pears will also taste better in jams or other dishes because the healthier and more natural the fruit, the less additives you have to add to it. Hello, Jestine. I’m glad you liked the posts and I hope you found them helpful. It’s great that you eat a lot of pears. You can’t go wrong with them. I like them too. My absolute favorite combination is pears and yogurt. I have enjoyed pears for most of my adult life. Pears and cottage cheese was my dessert choice for many years. That sounds like an excellent combination. I have paired pears with yogurt so far, but I’d really like to try your combination.